Maybe you found it easy to commit to “until death do us part”, but could you really commit to spending a full 5 or 6 months with your partner? Every minute of every day? If you’re the type of couple that finds a one bedroom apartment a bit crammed for the both of you, just imagine sharing a 7ft x 4ft nylon tent, while your partner takes off his stinky socks and starts waving them about. Would you be up for the challenge? Most people I’ve talked to have told me they don’t think they could do a thru-hike with their spouse, and I don’t blame them. Hiking with a partner has a lot of great benefits, if you can overcome some of the obvious difficulties. In this post I will try to address as many considerations as I can think of. The first obvious advantage is being able to split weight. Your packs will undoubtably be lighter than your fellow solo thru-hikers. You can split a lot of costs such as hotels, mail drops, and splitting a load of laundry. You can split a lot of chores like cooking, setting up tent, and getting water. I’ve seen hiking partners where one does all the work, giving the other a free ride, but I recommend trying to split chores up evenly. 6. You have twice as many eyes to see things. (even if they don’t want to listen), and you’ll always have a second opinion whether or not you want to hear it. 1. Who is the weakest link? You will always be limited by the slowest and weakest of the team, and you also have two times as many chances for one of you to get injured or sick. If one of you has to quit because of an injury, or another reason, will you both quit? Some people carry on without their partners, some don’t. That is of course up to you. You will always need to compromise to be a successful team. You will need to compromise on everything from hiking pace, town stops, how when and where to resupply, get water, stop for the night, and the list goes on and on. 3. Will you drive each other nuts? The answer to this is YES, you will. But if you’re OK with that, then great! I think this is the number one reason why a lot of people don’t hike with their partners. They don’t want to ruin a perfectly good relationship. There is such a thing as too much of a good thing, and you will undoubtedly reach that point somewhere along your thru-hike, and wish you could just hike alone. You’ll have at the very least a few small fights. There will be days when you’ll be moody, you’ll be tired, hungry and irritable. It’s how you deal with it that will get you through. Some very simple advice: Try to stay optimistic. Try not to hold a grudge. Be forgiving. Be honest. Be caring. You and your partner will undoubtedly be physically different from each other. Your physical strength, your hiking pace, your ability to carry weight, and your need for lots of calories varies naturally from person to person. It is a big mistake to simply ignore these differences. Dirt Stew and I are a perfect example. I am 5ft 5, and weigh roughly 130lbs. Dirt Stew is 6ft 4 and 180lbs. He eats 1.5 to 2 times as much as I do, and he eats it about 1.5 to 2 times as fast as I can, but he can carry about 1.5 to 2 times as much as I can as well. (Just to give you an idea, Dirt Stew was the record holder for fastest half gallon challenge at the time with 10 minutes, 19 seconds to eat one gallon of ice cream). For our Appalachian Trail thru-hike we decided that fighting over food would become an issue, and we decided to not try to eat out of the same containers so that we did not feel like we had to race to a belly-ache. Because I hike so much more slowly, and we wanted to hike together, I hiked in front, and Dirt Stew would follow so that I could set the pace. Some couples do not hike together all day long, but you must always remember what you have in your pack, and what your partner has in his/her pack in case you get lost and separated. People are also very different mentally. By this I mean their level of determination, their reaction to bad conditions, and their willingness to cope. If one of you has a much more powerful “drive” to complete the trail, take note of this. In our case, I am the stubborn, determined one. I did not want to compromise our thru-hike unless it was absolutely necessary. It proved to be very beneficial for me, the weaker, slower one to be the more determined, because the trail was much more difficult for me physically than it was for Dirt Stew. When Dirt Stew wanted to quit after many days of cold miserable rain, I could give him a long lecture about how hard the trail was for me, and how I wasn’t going to give up. Make a plan A, plan B, and plan C. If one of you gets injured, then what? What if one of you really wants to quit? What if one of you wants to quit 1 week into the hike? What if one of you is injured after completing 90% of the trail? Discuss what-if scenarios, and play them out. You should agree on a series of plans that will work for both of you. If you have managed to find someone who actually wants to go for such a long hike, and can take the time off, and that person is someone you actually like enough to spend 5 or 6 months with them, then you’re very lucky! Consider everything involved, and plan carefully, and I guarantee your hike will bring you two together in an amazing way. Dirt Stew and I have actually found that hiking together is even easier for us than living together. We’re incredibly lucky in that we get along incredibly well. Living together, and working at different jobs and coming home in a different moods made “real life” actually more challenging to us than “trail life”. Real life is cluttered with more complex chores, more stuff, and more obligations than the trail. 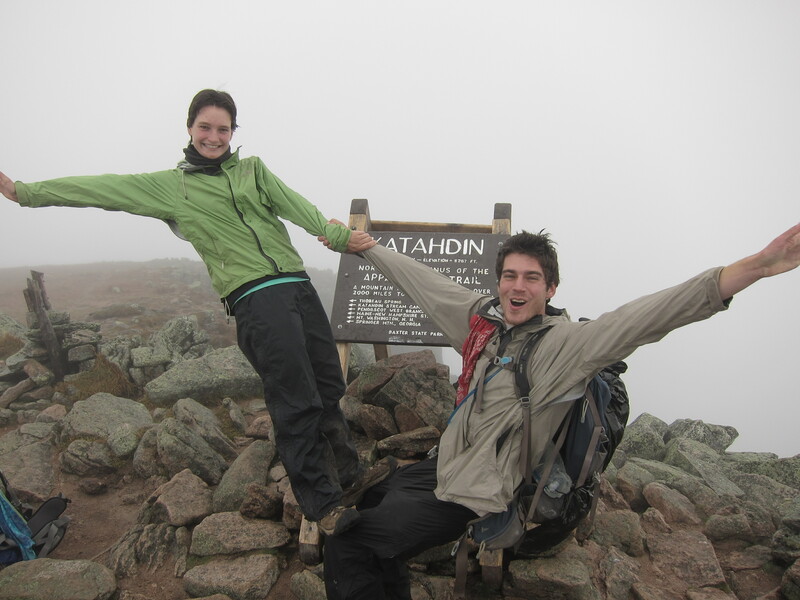 I was lucky enough to find someone who, after our first date agreed to hike the Appalachian Trail with me. I told him I was not looking for a relationship because I was going to be hiking the Appalachian Trail the next year, and I didn’t want to get involved with someone I’d just have to leave for 6 months. Dirt Stew without hesitation said “I’ll hike with you”. He never once went back on that statement. Six years later and now married, we’re planning our second thru-hike. This entry was tagged Appalachian Trail, Hiking, hiking partner, hiking with spouse, long distance hiking, pacific crest trail, Pacific Crest Trail Blog, pct 2014, PCT blog. Bookmark the permalink. Definitely a good post to write! We found out on the second day of the AT that I had to be in front. I continued to be infuriated by Panther’s faster pace and when I would catch up, hoping for a breath, he would just start up again. So we switched. If he was feeling slow or had a hurt foot, he’d be in front so we could take it easier. Hiking with a spouse can definitely work, there just has to be some communication on what each person expects!